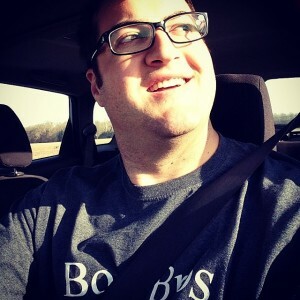 Why I Started Bold Bros.
Jason and I have started working on creating our own online courses and ‘creating online courses for other people as a service’. What I quickly realized is that between me and Jason, we have the skills to turn what we would normally consider the “wrapper” (ie. marketing materials) into a product that someone would buy over and over again. It’s the standard “do the work once, get paid over time” thing that could apply to making any digital product. The second thing I realized was that I could separate out the creation of the course from the production of the course and seek out people who already have content, but don’t want to make the course. In this way they can either pay us to produce their course or we pay them and sell their course over time to get our money back. Bold Bros is not about us making money – it’s about helping other people make money. Asana’s mission (a project/task management/communications app) is to prevent people from having to use email to communicate. But unlike Google Wave they don’t shove it in your face. Everyone at the company knows that’s the mission, but their customers are mostly unaware. Instead of stating that, “We want to help you make more money,” we internally know that is WHY we are teaching them to so the things that will help their business grow. This follows Simon Sinek’s “Start with Why” ideals and is similar to my old thoughts of ‘providing jobs for people’. If this interested you, you might like Why Do We Teach Business Owners About Blogging? I’m attempting to document recent history that is just outside my immediate memory and it’s a frustrating task because accounts change and files get deleted. Domains are let go and information is lost. 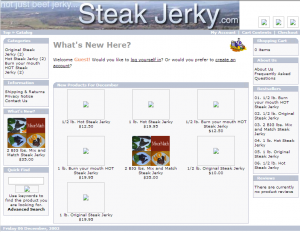 This is an attempt to recreate the story of my second ecommerce business, Steak Jerky, which was a partnership with my friend, Jason, in 2002. 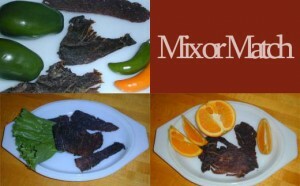 Jason had purchased a food dehydrator and had started experimenting with making beef jerky at home. He had just moved to Greenfield from Muncie and had a bigger kitchen to experiment in. This was before either of us had kids and while I was still finishing up college, he had graduated and so had lots of free time to experiment. Jason was the product guy and he had big ideas. He came up with a list of possible flavors and different ways to serve them. “If I can figure out how to do it, we might even have jerky chew also.” He spent a lot of time learning about jerky, how to make it, and about companies that were selling it. That’s actually how he got the idea – after stopping at a jerky store while out on vacation. If you’ve got some other ideas let me know. I was tasked with creating the website, logo, and the contract. I found a ‘mountain ranch’ image and used it as a backdrop for the relatively crude logo. Although I don’t remember for sure, the site looks like it was built on OScommerce, which was around in 2002. That’s the same platform I chose to use for my first ecommerce client in 2007 so it’s a good possibility that’s what it was. Not just beef jerky….Steak Jerky! The first sale was on November 20, 2002. The order went out in a plastic ziplock bag with black marker labeling. I remember asking Jason if he could vacuum seal the bags to make them look more professional, but at the time he didn’t have a sealer (he later got one). He was always experimenting with new flavors and cuts. He found that the best jerky was thinly sliced. I write on the labels for the customers. It wouldn’t be hard to design a logo for the packages and print on stickers that I could print out, but I don’t have the money to buy the sealer. I am going to add black pepper and backwoods garlic and pepper as flavors on the website this weekend. They will be variations on the original marinade. I’m not going to put up teriyaki until I know I can make it, but I will experiment with that too. We didn’t how to do SEO or any online marketing back then. This was even before we started Neighborhood Geeks together (we had previously ran an antique booth together and formed a band named Shog). I didn’t learn about SEO until I started Telablue in 2007. This was 2002. Twitter, Facebook, and Myspace didn’t even exist then and Google Adwords was relatively new (2000). I looked into Google advertising and I think that is the way to go at first because it should also get our listing up there quicker. Erich, I have sent you the hot flavors picture and the will be sending the 2 other flavors soon. I will need web versions of these. I also plan a page describing how much a half pound is and how much a pound is. Ross, if you still have interest, we need some modifications to the cart system. Ross was Jason’s technical advisor back then. That was before I got my A+, Network+, and Microsoft Certifications. That was before I learned CSS, PHP, and WordPress. The business didn’t last long. By December Jason had shut it down but not before we had orders from all over the country. I recently asked Jason why and he said, “At the time, it was going to be too expensive to scale up the professionalism of the product (like good packaging, consistent manufacturing, separate production area) to really be proud of our work for clients we didn’t know.” But we learned a lot. If this story interests you, you might also be interested in my first ecommerce business or my latest ecommerce business.